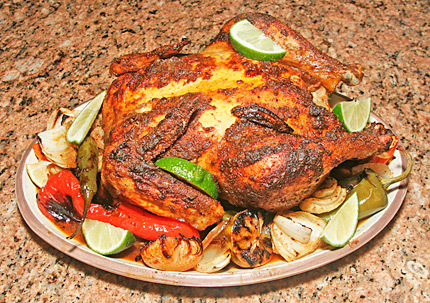 A Mexican take on roast chicken, with only mild heat if you leave the hot peppers intact. Great served with a spicy roasted corn salsa, or roasted corn mashed potatoes. Place the washed chicken on an oiled roasting rack*. I spray my rack with Pam to lessen sticking. Zest 2 limes and mix the zest with the butter, 1 tablespoon of cumin, and 1 tablespoon of chili powder. Halve the 2 zested limes and squeeze the juices into the body cavity. Dust the lime halves with cumin and place them into the body cavity with the sliced garlic, plus 2 tablespoons of chopped cilantro. Pour .75 cup of beer onto the limes and garlic in the body cavity. Rub the bird thoroughly with the butter and zest mixture. Dust the bird thoroughly with cumin. Salt and pepper to taste. Halve two limes and spray with Pam cooking spray, or rub with oil. Place in roasting pan. Quarter the onion, spray the pieces with Pam, and place them into the roasting pan. Place a meat thermometer so that the tip is in the thickest part of the breast meat. Add a cup of chicken stock and beer to the pan to keep the pan drippings from scorching during the roasting. Repeat with more beer or stock every half hour or so, as needed during roasting. If you are using a very large roasting pan you may need to add more liquid to keep the drippings moist. Scoop some of the liquid over the limes and onions during roasting. Don’t over-do the pan liquid. You want concentrated drippings for a sauce when you’re done, not soup. Place in the oven and roast at 375°F. total roasting time should be about 2-2.25 hours. When the bird is done the meat thermometer should read 180°F. After 1.5 hours, place the assorted hot and sweet peppers around the roasting pan and return the bird to the oven. Leave the hot peppers whole and the sauce with have only a gentle warmth. For larger sweet peppers, halve them and clear the pith and seeds. Place the chicken on a serving platter. Sprinkle the finished chicken with the juice of half a lime. Slice the other half of the lime for garnish, along with the roasted peppers, lime halves and onion quarters from the pan. Stir the remaning 2 tablespoons of fresh cilantro into the pan drippings and pour the drippings onto the serving platter. Garnish with more cilantro sprigs. If you are wary of so many hot peppers in one dish, relax. The hot peppers are left whole, and thus the spicy interior pith does not contact the pan drippings. It’s the best of both worlds: The drippings are only mildly warm, and your guests who like hot peppers can slice open a few of the peppers for themselves and get the full blast of heat. *If you don’t have a chicken roasting rack, you can use aluminum foil to improvise: tear off a 18 inch long sheet of foil and scrunch it up loosely to create more volume. Form the foil into a roll about 15 inches long and at least an inch in diameter. Shape the foil into an “S” shape and prop the chicken on the foil. You just saved yourself thirty bucks.